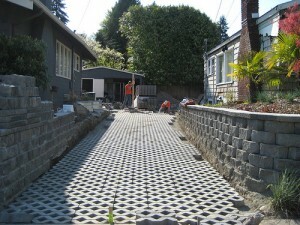 The installation of a grass paver driveway. If you have an area that requires detailed water management and drainage, needs to withstand heavy traffic and abuse, and doesn’t need to be aesthetically exquisite, grass pavers (also known as turf pavers, pervious pavers, and porous pavers) may be the best choice for you. The grass paver differs from concrete pavers in that they are hollow and “grid-like,” as you can see in the picture to the right. For those with environmental concerns, grass pavers are one of the best ‘green’ options out there. Grass pavers are primarily used in areas where soil erosion or water drainage is of paramount concern. For example, grass driveway pavers help stabilize the soil in an area where lots of vehicular traffic may unsettle and damage it. Water can also drain easily in between these paving stones, putting less pressure on water draining systems that would otherwise have to accept all of this rainwater running down grade. This can help with containing and controlling water pollution, as runoff from asphalt driveways can be very polluting due to all the chemical it carries. Grass pavers, however, allow water to drain free and clear, and thus represent an environmentally friendly driveway and paving solution. Another example of where this material may be used is where there is a hill, slope, or other slight grade that might run off or erode due to wind, rain, or other inclement weather or abusive forces. Grass pavers keep the area secure and stable while also providing a sleek look. A final example is any area that is flooded often. Normal paving options – concrete, asphalt, or even concrete pavers – do not drain water as well as regular ground, as the water will often slide down the grade. However, turf pavers provide both the strength and durability of concrete pavers with the drainage capability of grass or soil – a useful combination for some applications. Another benefit of these permeable pavers is how they support and protect the grass roots system. Constant driving and parking on the grass can easily tear it apart and damage it beyond repair. This can look ugly and require work to replace if you ever want to have grass in the area again. Well-installed grass pavers will help protect this grass and prevent major damage due to ruts and tears caused by moving wheels. Grass pavers are made out of many materials depending on the needs of the project. One common option is concrete, much like standard paving stones. Another choice is plastic; this is often used for applications that don’t need as much strength and need more subtlety instead (i.e. so they can’t be seen as easily by the naked eye). Plastic grass pavers are often used for areas like backyards that need the soil protection and water management but not the strength intended for vehicular applications. These “lawn pavers” actually leave more space for the grass in between the plastic, letting you get the benefits of the permeable paving system without the robust quality of the concrete variety. Grass pavers, because they are functional, do not focus much on looks, so you won’t find much variety in color, shapes, or sizes as you will with other concrete paving stones. If looks are a concern to you, you may want to look elsewhere, though there is certainly something to be said for the simplicity and utility of these grass paving stones. However, some people do enjoy the natural ‘grassy’ look of these pavers, especially as the grass grows over time. It can also help you blend in different areas of your yard regardless of whether or not you park on those areas – instead of installing a concrete or stone driveway to accommodate extra parking, for example, install grass pavers and you won’t have to have a jarring concrete blob on your property. Luckily, installing grassy pavers is quite easy compared to other options, and can often be completed by the homeowner. You should still consult your local contractor or paver manufacturer for assistance with your particular project. Maintenance is also easy, and you can often still mow the areas where these pavers are installed to keep the grass in check. Overall, grass pavers are often the most environmentally conscious and functionally effective paving material you can purchase. The concrete grass pavers ‘honeycomb’ is laid first on a graded, properly excavated area. Even though it drains well, it should still have a slight grade away from the home to ensure that the water doesn’t pool or flood. Depending on the volume of water you expect, you may have to install a drainage system and catch basin to help channel the water to where you want it to go. The base will want to be made up of 3/4 to 1″ of gravel or crushed aggregate. You’ll want to compact this surface. If the grass pavers are the concrete variety, they are laid much like concrete pavers are – by hand, one by one, in the pattern and shape as needed. Plastic grass pavers may be laid in the same fashion, or they may come in a roll (such as EZ Roll), in which case they are ‘unrolled’ around the area as necessary. After the paving system is installed, homeowners should check on it over the next few months to make sure water is draining properly and that there are no problems with the installation. After everything checks out, normal lawn and grass maintenance may go on as if the paving system weren’t in place. Best of all, the grass pavers cost is quite low compared to other paving options, and will depend on the usual factors (location, size, complexity, etc.). You can expect to pay somewhere around $2.00 a square foot. For plastic rolls, you can pay anywhere around $250-$300 per 4′ x 24′ roll – this translates into about $2.50 to $3.00 per foot. Installation may be extra for both of these depending on the project. All in all, you’ll probably pay more for grass pavers installation than for other materials options like concrete, asphalt, and the like. Note that you can save money on these projects by finding the material for sale or by laying it yourself – it is definitely a possible DIY project, within the skill of many homeowners. This entry was posted in Basics, Other Pavers and Materials, Project Ideas and tagged basics, concrete grass pavers, driveways, grass driveway pavers, grass paver, grass pavers, grass pavers cost, other materials, projects by Will Grander. Bookmark the permalink. What with the need to look after the environment and also to find cheaper paving options nowadays permeable pavers are starting to look a lot more attractive than perhaps they used to. There’s no doubt that they are a versatile type of paving with numerous applications and once the grass has grown properly within the centre of each block, this type of paving can actually be more attractive and natural-looking than one might initially think when they’re first laid.